Solgar Resveratrol is an excellent antioxidant that may provide nutritive support for heart and cardiovascular health. Resveratrol is an excellent antioxidant that may provide nutritive support for heart and cardiovascular health. Research shows that resveratrol may be the reason why some European countries have a population with better cardiovasular health. It now appears it may also play a key role in controlling cellular ageing processes. 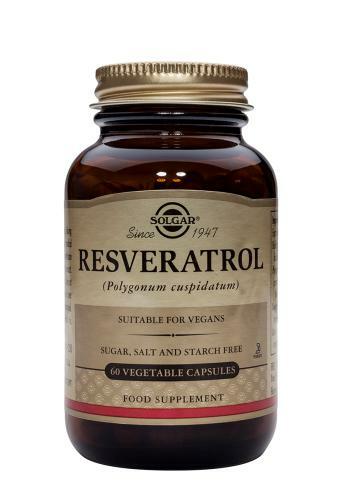 Solgar Resveratrol contains naturally-derived resveratrol from Polygonum cuspidatum. Keep out of reach of children. Women who are pregnant or planning a pregnancy should consult their doctor before taking nutritional supplements. Naturally-derived resveratrol from Polygonum cuspidatum root. 200mg Polgonum cuspidatum, supplying 100mg pure Resveratrol per serving.